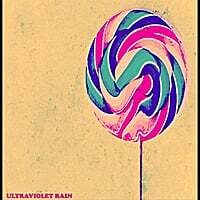 The Big Sweet-Ultraviolet Rain. It was almost a year to the date we looked at this Ohio band's debut album, Shot of Bliss, and they haven't wasted any time with the followup. Once again, these (now) 17-year-olds have produced a confident, assured mix of power pop and indie rock that belies their age. Whereas last time they covered Big Star's "September Gurls", here they assimilate their sound in "Laces" (while the skittish "In and Out of Style" recalls solo Alex Chilton). Also of note are the pop/rocker "N-O", which doesn't quite go where you expect it to, and the jangle of both "As You Wake" and "Ancient Psych". With enough winding turns and crooked alleys, Ultraviolet Rain isn't cookie-cutter power pop - but in this case, the journey is a much fun as the destination. Dropkick-Time Cuts the Ties. 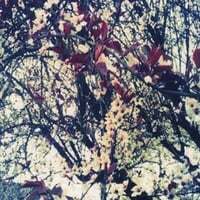 I've been listening to this prolific (9 full-lengths plus a handful of EPs in the last 10 years) Scottish band for several years now, had their records in my top 100 lists, but until now had not featured them on this site. I'm remedying this oversight with their latest, Time Cuts the Ties, as it's emblematic of their body of work and a damn good listen. Dropkick specialize in the melodic pop of bands like Teenage Fanclub and Daniel Wylie-era Cosmic Rough Riders with a touch of alt-country, suffused with Pernice Brothers-like harmonies. The standouts here are "Bad Line", an uptempo number augmented by piano that wouldn't have been out of place on the Pernices' Overcome by Happiness album, the stately power balladry of "Home", and the lovely, waltzing title track. Have a listen below, but set aside some time - once you introduce yourself to them, you're going to want to delve into that deep back catalog. 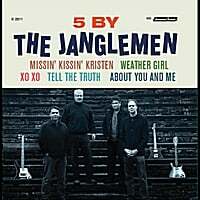 The Janglemen-5 by The Janglemen. Hey, sometimes the reviews write themselves. In this case, the band name and the title do a great job of summing things up. If you like this NYC band's full-length debut in 2007 or just like jangly power pop, this EP is for you. "Missin' Kissin' Kristen" is worth the price of admission alone, all Rickenbackers and catchy melodies. Also of note is the merseybeat of "XO XO", and the almost Knack-like "Weather Girl". Jangle on! Let's start the work week off with a couple of old friends here at AbPow. The Riffbrokers-Every Pilot's Blinded by the Sun. Seattle's Riffbrokers are back with their fifth full-length, and it's more of the same no-nonsense power pop/classic rock that they have become masters at. Their sound is equal parts Tom Petty and The Replacements with a dash of Exile-era Stones thrown in, and the rocking "Better Angels" is the definitive proof of this amalgam. Nick Millward has just the right voice for this style of rock, and his bandmates provide a killer rhythm section. No bad tracks here, but more equal than others are the rocker "Mindset", the soulful "Calling All The Charlatans" and the catchy album closer "Thank You". No, thank you, Riffbrokers, for keeping the rock flame burning. 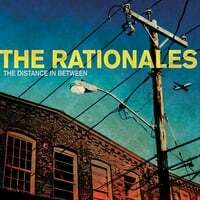 The Rationales-The Distance in Between. We last heard from this Boston band a few years ago with their fine EP The Going and the Gone, and here's their equally impressive full-length debut. Once again David Mirabella & Co. straddle the line between power pop and Americana, and if you like bands such as, say, I don't know...The Riffbrokers? you'll love this one. Opener "Real Life" builds from its rootsy verses to an anthemic ending, "Braedon" packs more punch in its sub-2:00 running time than most songs do in 4, and the rocker "Jaded" recalls Being There-era Wilco. And don't miss the chiming, jangly "Tongue Tied", the latest and greatest entry into the fellowship of "summer is over" songs. You won't have to rationalize picking this one up. A free download of Plasticsoul & Brandon Schott covering Big Star? You don't have to drag me screaming to that. Chris Richards with another vault-clearing collection? Always good stuff if you recall his previous Pathetic History. Daniel Person is a UK artist whose sound falls somewhere between Elliott Smith, Ryan Adams and Jesse Malin, and he's offering up "Wishing Well", the first single from his new album as a free download. It's a quality tune. Oh, and it's not on Bandcamp, but here's a free download of the new single from Fountains of Wayne, Richie and Ruben. 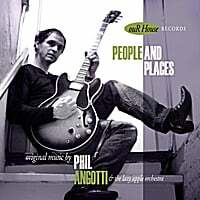 Phil Angotti-People and Places. In my power pop travels over the last several years, I've seen Phil Angotti's name show up here and there but I never got around to hearing his music. If his newly-released People and Places is indicative of his larger body of work, I've really been missing out. Trading in Beatlesque pop (especially the McCartney strain), Angotti has crafted a pop delight here that will appeal to fans of David Grahame and similar artists and serve as a nice complement to the recently-released Smith & Hayes album. There's quite a lot to like here, from the shuffling opener "My Ol' Records" to the jangly "You Were Right (Probably)" to the exuberant pop of "I'm Yer Man". But what sets this album apart from the typical Beatle pastiche is Angotti's facility with the slower numbers, some of the album's best: "I Guess" is one McCartney probably wishes he wrote, and "Me and Donnie Vee" is a lovely midtempo number in which Angotti reminisces about playing with his longtime friend Donnie Vie from Enuff Z'Nuff. A real treasure, and if you go to the CD Baby link below you can get his thoughts on each of the tracks. 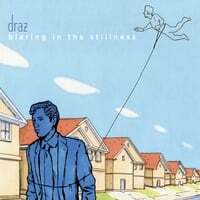 Draz-Blaring in the Stillness. This New York band manages the feat of being indie enough to impress your hipster friends and melodic enough to appeal to power poppers. I was drawn in my opening track "When the City Burns", which seemed to find the middle ground between The Shins and Squeeze, and was happy to stick around for the rest with the standouts being 90s college radio-styled midtempo rocker "Heaven Sent", the Smiths-inspired "One of the Boys", and the fab "Love Letters". These guys know their way around a pop hook (see also the infectious "Astor Place"), and they should find their way into your mp3 or CD player.